Our experienced nursing staff have extensive experience in giving vaccinations and travel advice to ensure that you get the immunisations and advice you need for your journey. Melanie Sumner joined Milton Keynes Village Practice in 1998 as a Practice Nurse having previously worked at Milton Keynes General Hospital. 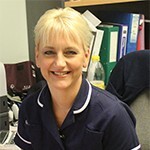 She has played a major role in developing our wide range of clinical services and in 2007 became partner in the practice. She has extensive experience in travel medicine and travel health consultations and since the practice opened in 1998 has been the clinical lead on travel health, developing her role as a Travel Health Nurse Specialist.